CGA's Legislative Internship Program Now Accepting Applications! Attention college students! If you are looking for hands-on experience in state government, applications for the 2019 Legislative Internship Program are now being accepted. The application deadline is November 1. 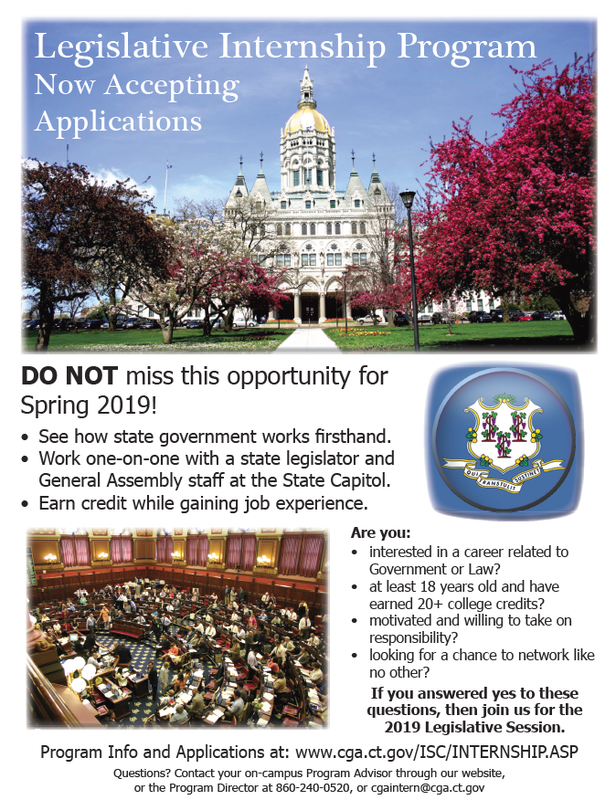 The program seeks to offer Connecticut college students the opportunity to gain first-hand knowledge about how state government works through hands-on experience in the Connecticut General Assembly. Students will learn the formal and informal aspects of the legislative process, and will be provided with opportunities for training and academic examination. They will also become familiar with bill tracking and analysis, policy research, drafting news releases, speeches and/or testimony, social media and administrative functions. To be eligible for the program, students must be at least 18 years of age, have completed 20 college credits, possess a minimum 2.7 GPA and be registered for a course to receive internship credit. Additional information about the program is available here.